My masters' study explored the historical significance of Romantic landscape painting, inspired by Moses Tladi, one of the first SA pioneer artists working in the oil painting convention. Informed by my research on Tladi’s work (as it relates to matters of modernism, theories on landscape, imperialism and the Lutheran missionary project), my focus ultimately fell on the potential of the artist to transcend the exterior world through painting. In this I argued that Tladi makes use of a hermeneutics ‘from within’, rather than one aimed at Realist exposition. 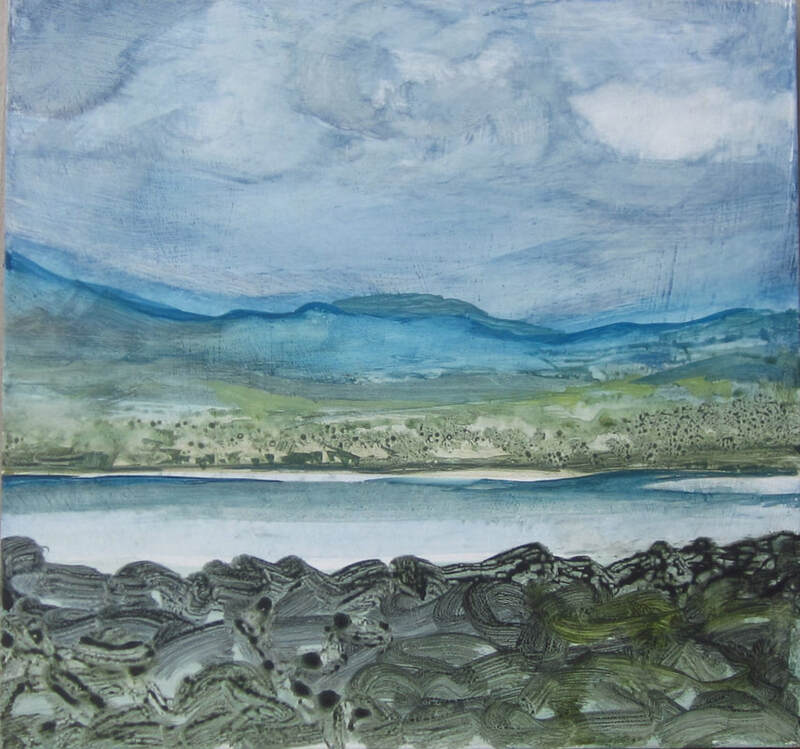 Employing such a hermeneutics in my own practice, I aimed to draw attention to landscape not as a mere external representation of a physical reality, but as an intimate study of visual and emotional stimuli, by the representation of which the artist seeks to escape (and transcend) his/her own reality. In Tladi’s work a pastoral world-view is expressed both in the sublime expanse of the ‘untouched’ landscape (the Wilderness) and in the domestic, everyday reality (The Garden). In the Romantic landscape convention, the Garden – often bordering on the picturesque and kitsch - and the Wilderness – intended to evoke a feeling of the sublime - offers an escape from the pressures of a politically fraught society. 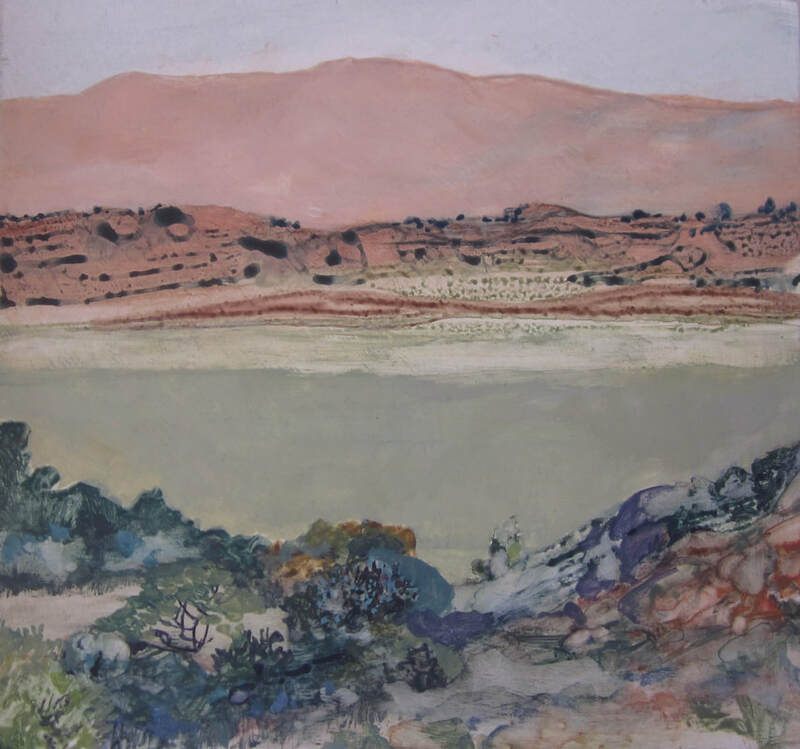 In this study I aim to recontextualise the basic premises of Romantic landscape painting in my South African and African context. I do this in order to explore how certain ‘Western’ art-historical designations function in this setting, and whether landscape can be an appropriate tool for critical art making despite its particular historic signification. Intensified by my journey with Moses Tladi and informed by my prior knowledge of Romanticism, I ask whether it is necessarily the role of the artist to expose and explore the power relations embedded in certain geographical spaces, and whether landscape painting can not seek to transcend these realities. I suggest in this regard that depicting the landscape as serene and ‘non-political’ does not deny the politics of the exterior world, but that it draws attention to the inner reality of the individual, a political choice. The artist makes use of a metaphorical, spiritualised language to give transcendent characteristics to the elements of the physical world, a process which is highlighted by an emphasis on markmaking. Through spending time in certain geographic spaces, the artist explores the formal potential of the landscape, seeking to translate the visual impulses created by this physical world in an intuitive and meaningful way. Figure 2: Acrylic and poster paint on box crate, 31.5 x 25cm. Figure 3: Acrylic and poster paint on box crate, 31.5 x 25cm. Figure 1: Acrylic and poster paint on box crate, 31.5 x 25cm. Figure 4: Acrylic and poster paint on box crate, 31.5 x 25cm. ​I have worked primarily in landscape, and was surprised at the extent to which my practice changed during the time I was in Kampala (as exchange student for four months). Interiors was a subject I had rarely used before, and I did not initially see how this fit in with my project on landscape and Moses Tladi. In retrospect, however, these intimate works became symbolic for how figurative painting can represent a quest for transcendence from an outer reality, something I sense in Tladi’s work. The city was an important theme in my Kampala experience, something which has a specific relation to both the Garden and the Wilderness. For me Kampala manifested primarily as the ‘locus of the market’, as Cosgrove describes the city (1998:44). Kampala is the hub of business in Uganda and hosts a population density of about 9,429 people per square kilometer, excluding the many people who flood into the city by day and leave again at night. The traffic entering and leaving Kampala causes mass traffic standstills all around the city, and the huge number of pedestrians, motorcycles and bicycles on the roads make it difficult to travel by foot. In many other respects, Kampala is like a South African city. For someone not used to the city, walking, a leisurely and stimulating activity, became a difficult and hazardous way to travel. This was part of why my focus changed from the outside world to an inner world, so that most of my moments of rest took place within doors, and more intimately, in my own imaginary world. The interior spaces I moved in became the main subject I engaged with in this time. After a few weeks with a local family, I moved into an apartment on the third floor of a residential compound, a small flat which I shared with two other students. 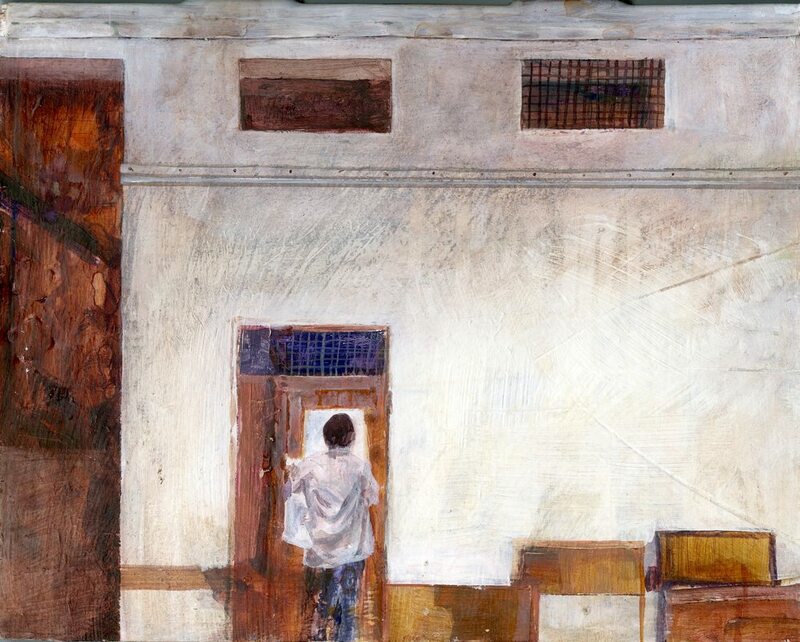 I started painting in my room, something which became very much part of my daily life: Electricity and water failures in the building influenced progress, and the wire mesh covering my window (most windows are covered on account of mosquitoes) did not let in much light. The medium used in this series became an important part of how the works developed. As oils would be difficult to transport and I did not have a studio, I opted for acrylic paints, which allowed for successive layering and painting. Because I had a limited number of boards, I had to recycle them for the remaining three months of my stay. I started about ten paintings, using photographs of some of the significant or interesting spaces in my city experience. This included urban‘gardens’, landscapes, two street scenes and images of the apartment. Of the ten works I started in this way, I finished only about seven and I chose to exhibit only four or five. 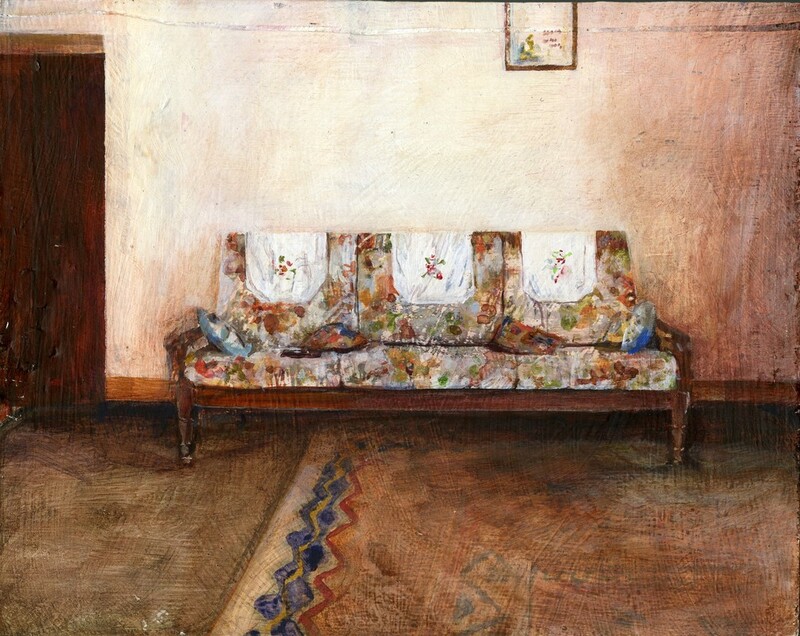 The works all depicted specific interior spaces, for example the visual arts department, a bedroom, an office and an apartment interior. In these work, painting became an obsessive act. The PVA was water-repellent and conflicted with the water-based acrylic and poster paints I used. This caused some colours to come off in strange patterns, seen for instance on the left hand side in figure 3. I applied paint with brushes, tissues and pieces of fabric and sometimes removed it with a nail file. This was significant in that I felt very aware of the sensation of the painting surface. In areas where the painting became overworked, or where I wanted to remove certain elements, I re-applied the primer, masking out whole areas in white. 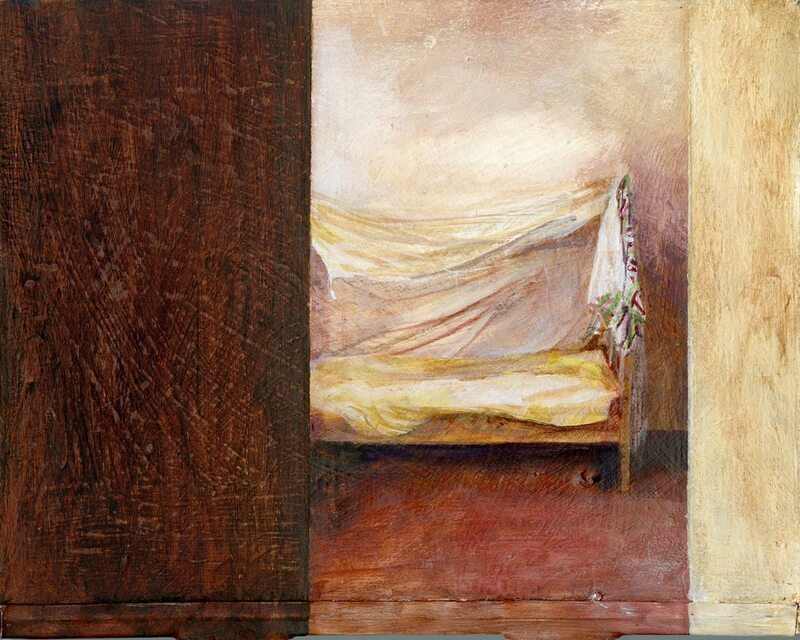 In most cases, I covered figures or objects in the space, leaving the rooms nearly empty (such as in figure 5). Due to the successive layering and masking of paint, the original spaces - which started out as representation of actual locations - are now barely recognisable. In retrospect, I believe this was a cathartic process, part of my dealing with the claustrophobia I felt in the city. The work slipped into a visual rhetoric bordering on the ‘kitsch’, because it sought out some form of the safe and beautiful. The ‘domestic’ in these work (such as in figure 4) helped me familiarise myself with the alien circumstances, and in this way became a means of ‘home-making’. For the exhibition, I keep the works unframed in order to draw attention to the coarse edges of the wood. I removed the small semi-circle fittings on either side with a clipper, as they were quite distracting, but painted over the rectangular fittings, which were bent over to one side. The works are shown as a visual whole and are placed at eye level, floating slightly from the wall. Figure 11: Plantations near Mbarara (2014). Gouache and acrylic on board, 19.2 x 19.2cm. Figure 6: Savanna Scene (2014). Acrylic, gouache and oil on board, 15 x 15cm. Figure 9: Forest scene with two figures(2014). Gouache on board, 15 x 15cm. ​Figure 12: Landscape - forest scene (2014). Gouache and acrylic on board, 19.2 x 19.2cm. Artist’s collection. Figure 13: Pathway — Southern Uganda (2014). Gouache on board, 22 x 17.5cm. 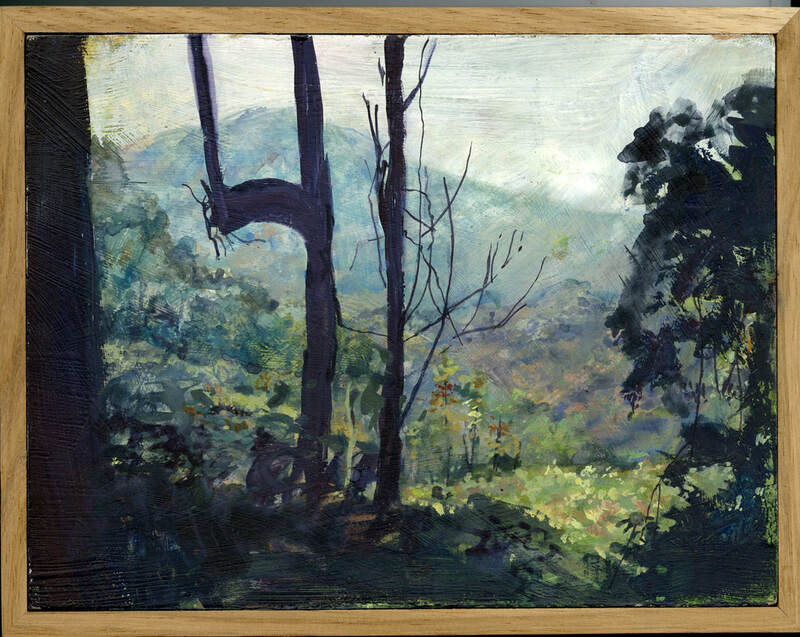 Figure 10: Yda Coetsee, Forest silhouette at Bwindi (2014). Gouache and acrylic on board, 22 x 16.5cm. The small framed paintings in the "Garden series" can be interpreted as Romantic, and at times picturesque, expressions of certain landscape memories. Whereas the majority of my time in Uganda was spent in the city, I was able to travel to some of the National Parks before returning home. Although my circumstances back in SA offered more freedom in terms of working space, I once again painted in the privacy of my bedroom, relying heavily on photographs. The paintings of these ‘hidden gardens’ has an almost confessional character, something which is echoed in the small scale of the work. Part of the methodology of the Kampala works was repeated in this set, although to a lesser extent. 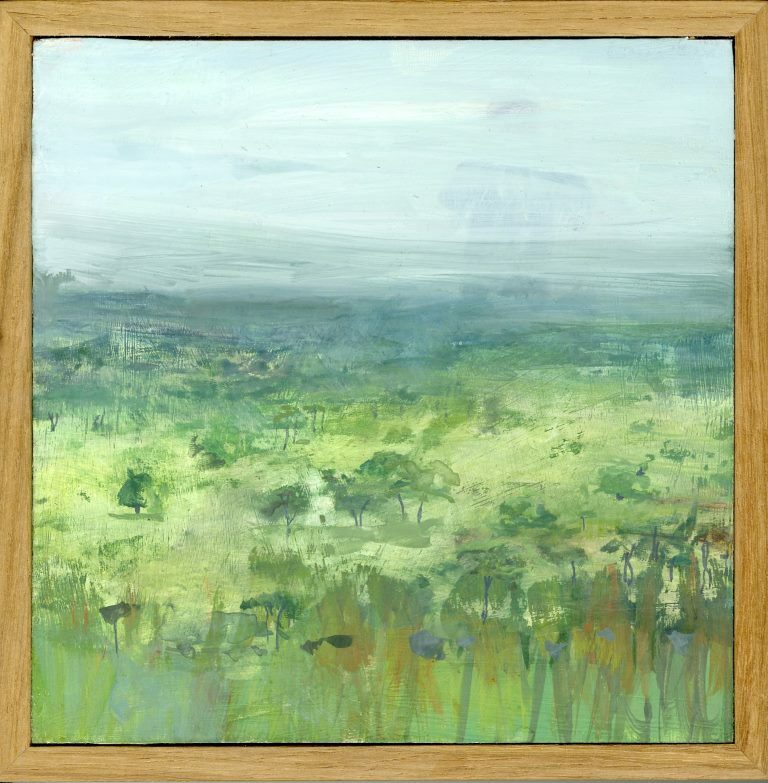 In a work such as Savanna scene (figure 6), there is a feeling of paint being removed, rather than marks made intentionally. Some of the works are painted on recycled boards that I had primed and used for earlier work, and I casually allowed the earlier textures to show through the paint surface. Recycling and reusing became very much part of my life. In this work the ‘damaged’ surface seems to disrupt a landscape which is otherwise pleasant, luminous and in a way naive. The depth which is created by the impression of a distant horizon is unsettled by the confusing lack of perspective when seeing the work from nearby. As in some of the other works, there is a tension between opacity and translucency. The ghostlike figure in the sky in figure 6, for instance, is an accidental part of an older, recycled artwork. Forest scene with two figures (figure 9) is less transparent than Savanna scene, and has a more conventional aerial perspective. A square format is used in both works, partly to denote structure and symmetry, but also because it echoes the work of Ferdinand Hodler and Gustav Klimt, both artists who have had an impact on my work. The flattened, pattern-like style of Hodler can be seen in landscapes such as Landschaft bei Château d’Oex and Forest brook at Leissingen. 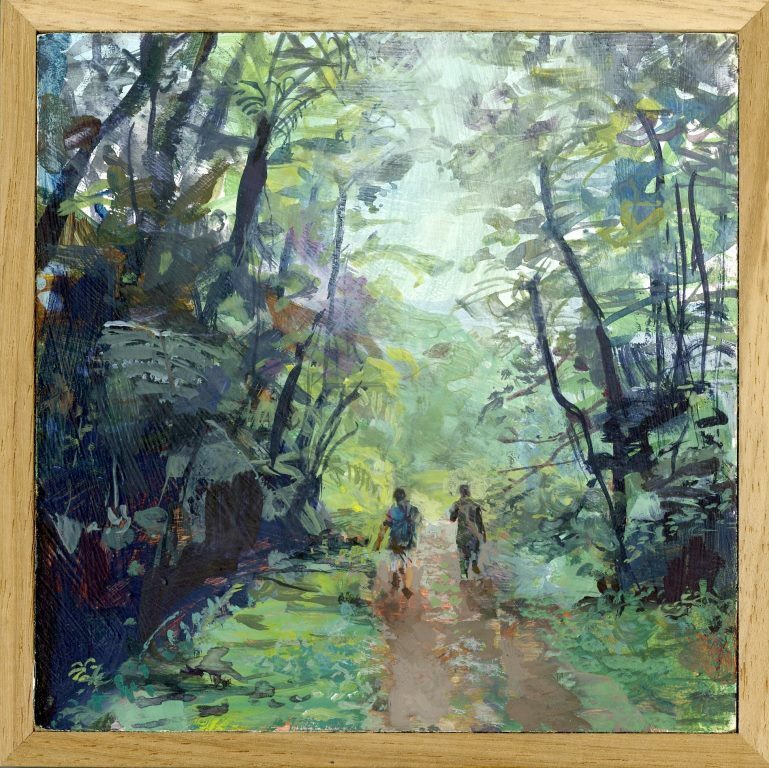 In its application of paint and use of colour Forest scene with two figures (figure 9) evokes the picturesque rather than the sublime; yet the Jeep track running through the rain forest could encode a set of environmental and political associations in Central and East Africa, one creating a certain tension. Although the work is small, it depicts the forest as large, unfamiliar yet awe-inspiring, shrouding the two figures beneath it. The presence of figures in this work is an exception. 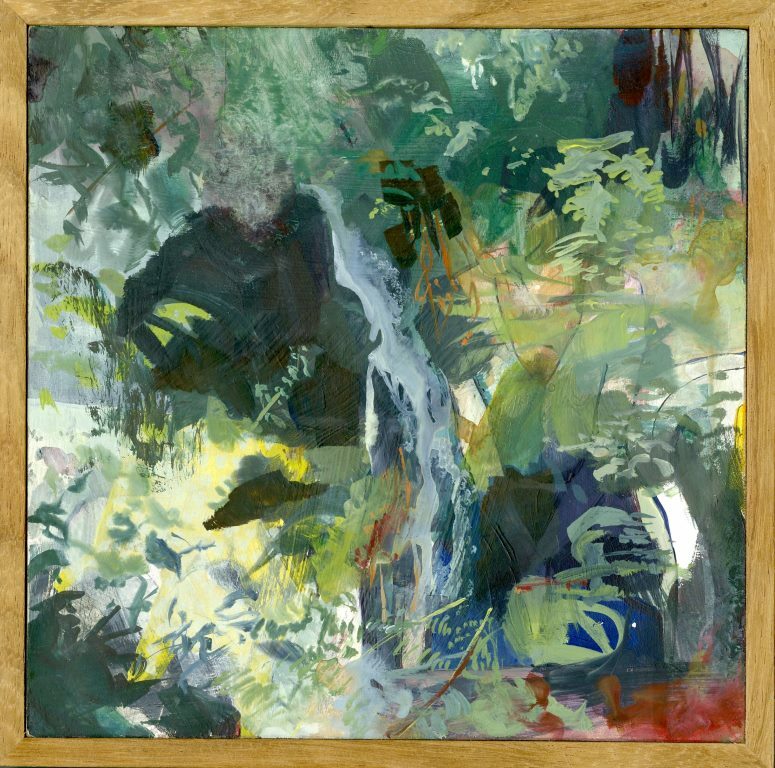 Like the artist David Caspar Friedrich’s Rückenfigur, figures in the landscape allow the viewer to place themselves in the narrative position, something which is implied in a work such as Forest silhouette at Bwindi (figure 10), where no figures are used. Figure 10 portrays an ‘insider’s view’, albeit an illusion. In all of the parks we visited, it was obligatory to be accompanied by one or more park attendants carrying arms. This created a feeling of foreboding and haste, intensified by the emptiness and stillness of the park. As in Kampala, the phenomenology of walking was an important part of the visual experience. Due to the regulated walking of the park attendants, ‘walking’ in this context became a means to an end, somewhat distracting from the leisure usually associated with sightseeing. In my surreal Kampala experience the expansive landscape outside became an unattainable sanctuary. The pristine natural environment of the National Parks, which in effect is Wilderness sanitized, evoked a sense of nature ‘before’ human habitation. In this way, it was both Wilderness in the traditional sense - nature uncultivated by humans - and a Garden of Eden, a place of sanctuary enclosed by the security of the National Park fence. Cosgrove and Daniels believe that, “while landscape for the Romantic poets connoted an attractive, elevated, comprehensive, disengaged and orderly view of the world […] so it was also distrusted (sometimes by the same poets) as a pernicious delusion, a dazzling trick designed to distort the world and its workings” (1988:7). Since the Romantic era artists have been sceptical of the representational aspect of poetry and painting. In my own oeuvre there is a clear emphasis on mark-making. This is a direct result of the handling of the painting medium, but in effect draws attention to the painting surface and (albeit in retrospect) to the ‘failure of representation’. Shaw explains that in much of contemporary theory, “[t]he sublime experience points no longer to an object beyond reason and expression,” that is, the Divine, but rather to “that within representation which nonetheless exceeds the possibility of representation” (2006:4). In Forest scene with two figures (figure 9), I alternate small, detailed elements (e.g. bottom right) with large, scratchy brushstrokes and blotches. In Landscape - forest scene (figure 12) the landscape subject is almost completely abstracted. The varied paint application and lack of aerial perspective creates a flattened, organic design, something echoed in Plantations near Mbarara (figure 11). Cosgrove and others write extensively on the mythology around the Pastoral. This category of landscape painting, as explored in Tladi’s work, has its roots in classical and biblical imagery and captures the Arcadian relation between humankind and nature. The Pastoral also “expresses itself through modes of production, patterns of settlement, and folk culture that spring from the unceasing inhabitation of the same place or region” (Foster 2008:48). 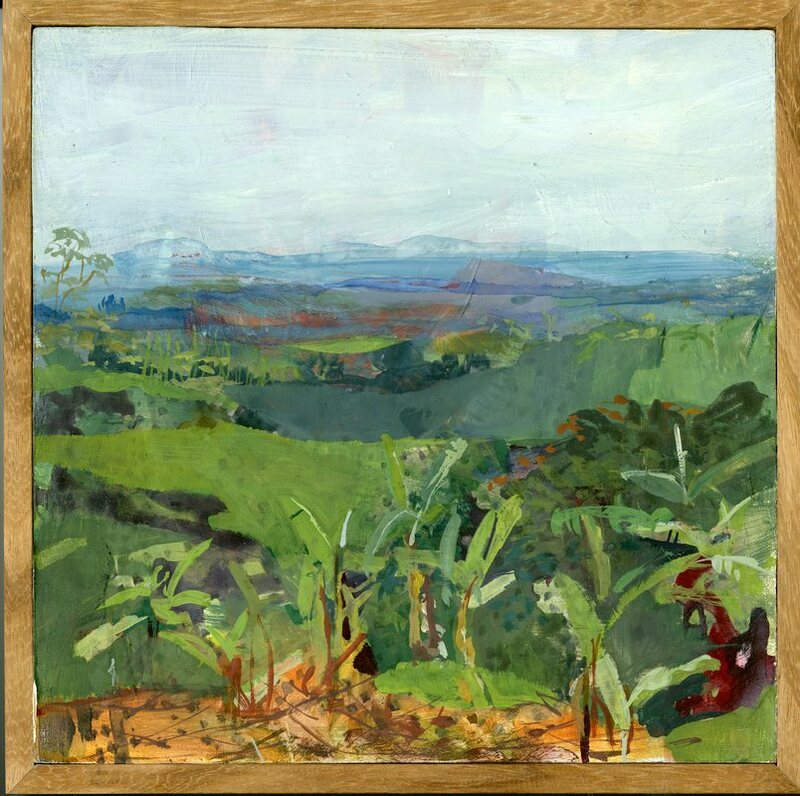 Plantations near Mbarara (figure 11) is the most ‘cultivated’ of landscapes in the Garden series. The banana plantations and red soil is typical of the Ugandan setting, and specifically of the Mbarara area in the West where the original photograph was taken. Although the plantations mark the setting as something ‘domestic’, bright red and black areas in the work enhance the feeling of the tropical and even suggest the poisonous (bottom right, figure 11). The layered middle ground creates a feeling of abstracted design. On the surface level Garden series signifies different degrees of human occupation and intervention in the landscape. Yet this aspect is shrouded almost entirely by the emphasis on the formal characteristics of different kinds of landscapes. 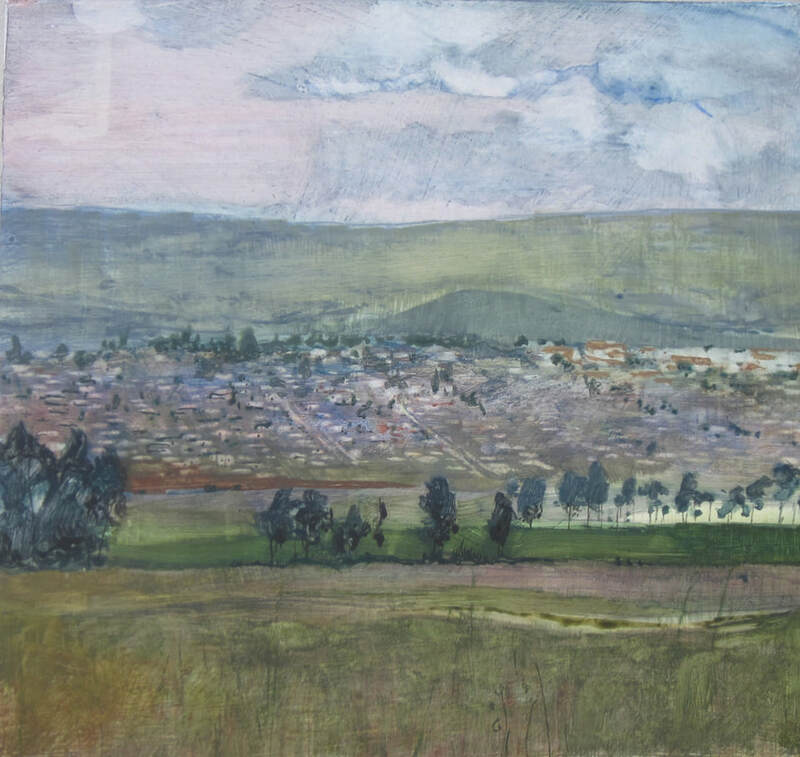 In works such as Plantations near Mbarara (figure 11) the landscape is reduced to abstracted marks hinting at certain landscape elements, almost like Paul Cezanne’s Mont Sainte-Victoire works. Rhythm, texture, mark-making and improvisation have become the main subjects portrayed. In retrospect, the most picturesque of my works became dreamscapes and, in a way, surreal. The forest experience was conflated and confused with the many emotions and memories of the Uganda experience, and although the Garden works were more pleasant to create than the Wilderness series, they acquired a sad nostalgia. 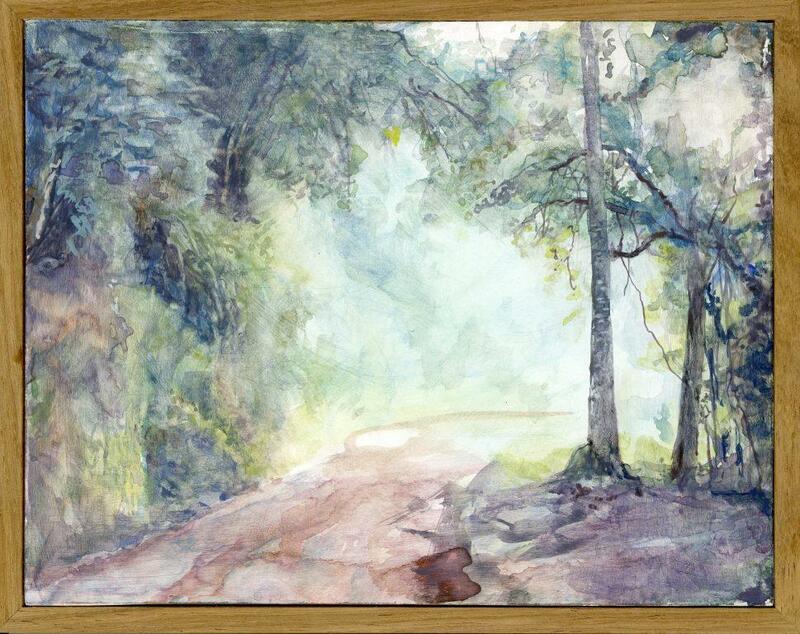 Pathway — Southern Uganda depicts a meandering road in an iridescent forest setting. Although no figures have been added, it is suggested by the path that the viewer is making his/her way from darkness into light, something which has a spiritual and psychological connotation appropriate for the melancholia I felt at the time. Apart from the title, little geographic clues are given to the location of the site. In most of the work, the nostalgic element is accentuated by the effect of the painting surface. 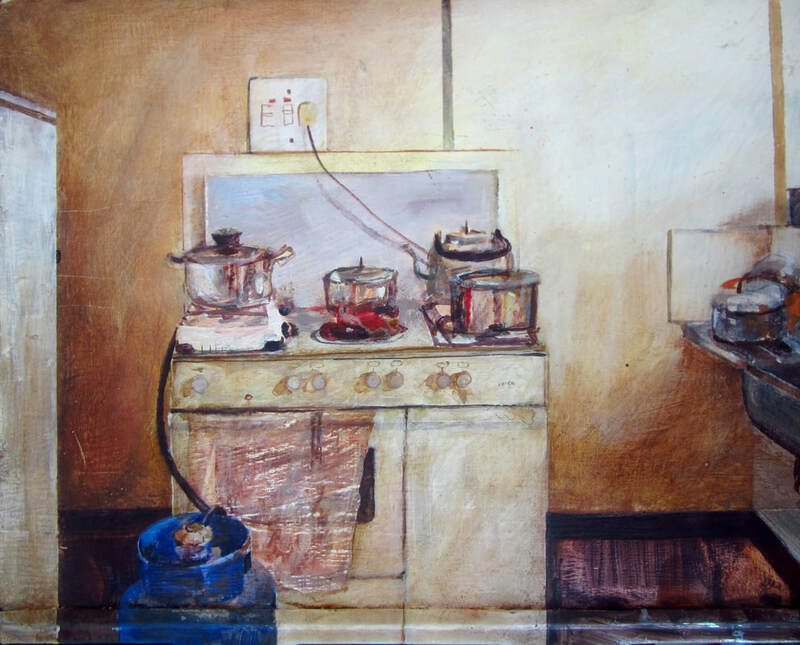 All the painting in this series was done partly in gouache, a medium with a dry and matt surface texture.The effect of the gouache paint is a ‘dryer’ texture, lacking the immediacy of oil and somewhat resembling old print reproductions. Someone remarked that the lack of patina in my work suggests a lack of ‘residue’, as if the paintings were painted in a different era but did not convey the historic contention of the garden idea and the colonial picturesque. My response in this regard is that focusing on the individual’s experience is a political choice, and the pastoral or Edenic world view is not bound to a certain art-historical context. 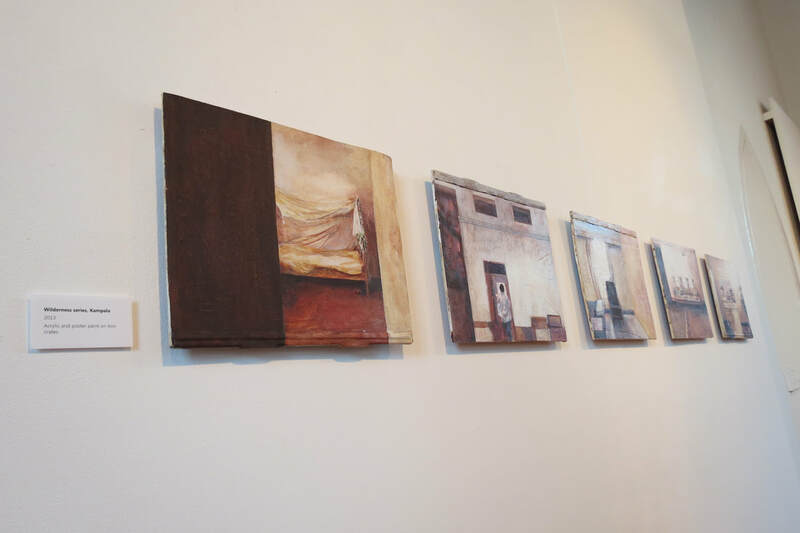 I framed the works in simple, contemporary frames, which in my own view is an important tool to indicate the time and context in which the paintings are exhibited. The works were framed in Kiaat (Wild teak), a South African wood, and stayed unvarnished to compliment the mostly matt finish of the paintings.